Kirby is an artist who found a magic crystal. He is a homage to the legendary comic book artist Jack “The King” Kirby. In both the original Mirage comics and 2003 series, Kirby lives in a leased office space in front of the cellar in April’s apartment. He is shown to be a very talented drawer with a large imagination. Kirby appears in Donatello #1. He is first seen in his office space drawing a fly creature with his pencil as Donatello peaks through the door. The fly creature Kirby just drew startles Donatello which in turn startles Kirby. Kirby is surprised since he didn’t remember drawing him and comes to the conclusion that he must be real. He assumes Donatello has come for the crystal and defends that he was only borrowing it for a while. Donatello assures Kirby that he is a friend and questions him about how he made those drawings come to life. Kirby tells him that it was the crystal on his pencil that supplies the “magic”. He explains that he had found the crystal by accident a few months ago and discovered what it could do. He then shows Donatello a doorway he had drawn that didn’t go away, unlike the rest of his drawings. Donatello steps through the doorway, and tells Kirby that he must see what’s on the other side. Grabbing his sketch book, Kirby jumps through the doorway and is caught by Don. They then spot a strange looking creature with horns which Kirby recognizes as something he has drawn. They both witness more of the strange creatures attacking the human types. Noticing the struggle against the amount of creatures, Kirby helps Don out by drawing him, what he calls, a “Gravitic Equalizer” that cancels out the gravity equation. He then draws Don a “Mobile Creep Trapper” that responds to brainwaves. He notices that the Trapper has filled up quickly, Kirby tries to think of another way to stop them. Realizing that the creatures are all in his sketchbook, he quickly draws all of the creatures bound with metal cuffs making it so they cannot move or fight. Kirby appears in the episode The King. His role is highly similar to that of his comics counterpart. In this world, Kirby found an odd-looking gem in a coal pile and attached it to his pencil. After doing this, everything he drew came to life temporarily, except a portal-like device. When Donatello found Kirby when helping his brother Raphaelturn the water temperature hotter, they went through the portal, and found that everything he had drawn since putting the crystal on the pencil had become a world. The villains he had drawn were overunning a city, and Donatello and Kirby managed to defeat all the villains. 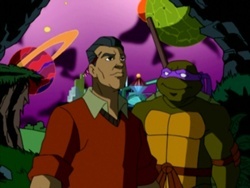 There was only enough time for one of them to get back through the portal, and Jack forced Donatello back through the portal. Jack had enough time to send a note to Donatello through the portal, however.